The ways of love can be complex. Sometimes a relationship full of unexpected twists and unlikely turns leads to a bond that's strong and secure. 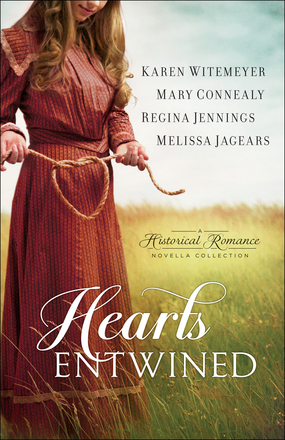 Join Karen Witemeyer, Mary Connealy, Regina Jennings, and Melissa Jagears for novellas that follow the winding path of romance in stories that celebrate a love that lasts forever. When Claire Nevin's troubled younger sibling sends her an unexpected package by rail, the gift and the man who delivers it--an unexpected face from the past--threaten to upend Claire's life forever. Fighting to hold on to all she has built, will she lose what matters most? I teared up in the first chapter... Really, Karen? Your books are supposed to be humorous and make me laugh... In the end though, I did get a few good laughs out of this story. And it was pretty beautifully put together. Who doesn't want a man who is devoted to you through thick and thin. I fell in love with this one from the beginning, and enjoyed every bit of it. Connor Kincaid returns home determined to win the hand of the woman he was too young for when he left. But Maggie is training to be a doctor in a distant town, while Connor's about to settle on a ranch. Will either be willing to give up their dream? Or will they both have to give up the love of a lifetime? This was a real treat after having just finished reading Regina's novel Holding the Fort. I had a good laugh as Private Willis met his match, but then again so did Ambrosia, whose trek across the desert was not quite what she imagined it to be. Regina told a good tale from start to finish. Camel stories, horse tales, outlaws and a pretty woman, set the stage for a great plot, excitement and a little romance. It didn't take long to read through it. Tied and True Wealthy Marianne Lister is in love with business assistant Calvin Hochstetler, but he can't see past the difference in their social status. When Marianne takes a job to prove that she is prepared for a life of hard work alongside the man of her dreams, will it be enough to convince Calvin to risk it all for love? This is a collection I am sure you will enjoy, as I did. These authors are all wonderful in their own way, each with their own style. The stories are short and can be read relatively quickly, and yet they are deep and meaningful, and inspirational. For those of you who enjoy a humor romance combination, you will find this book to be adventurous and romantic. I am very grateful to Bethany House who sent me a free copy to read. I was not asked to review positively, only to give my honest opinion, which I have.